I was out watering potted flowers the other day and saw some movement in the Penta. 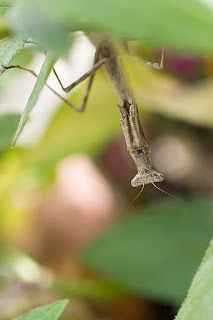 I looked closer and saw it was a female Praying Mantis who wasn't all that thrilled to get wet. She went to the underside of the leaves which is where I was able to capture her looking at me. Such cool creatures.